NEW DELHI: Reliance Jio set a new trend of unlimited calls and other freebies when it launched - Jio Summer Surprise and Jio Dhan Dhana Dhan - offers in March, 2017. Soon, the trend was followed by other network operators such as Airtel, Vodafone, Idea, BSNL etc. Reliance Jio has updated its Dhan Dhana Dhan offer with a new Rs 399 plan. The company has also revised existing plans as well and has extended the validity of different plans for both prepaid and postpaid customers. Starting with the postpaid plans, the incumbent operator has revised the validity of Rs 309 plan to 56 days and the plan will continue to offer 1GB of data every day. Coming to the new plan of Rs 399, it comes with a validity of 3 months and users will be getting 1GB of data every day, which makes a total count of 90GB. Then there is Rs 349 plan, which comes with a validity of 2 months and offers 20GB of data per month. The Rs 509 and Rs 999 comes with a validity of 2 months and users will get 120GB and 90GB respectively. 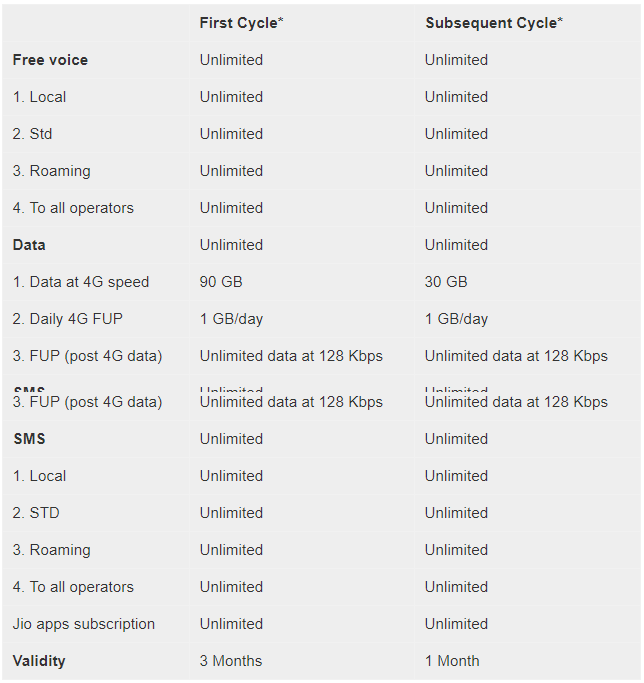 Further, the former offers a Fair Usage Policy (FUP) limit of 2GB per day, while the latter has not FUP limit. 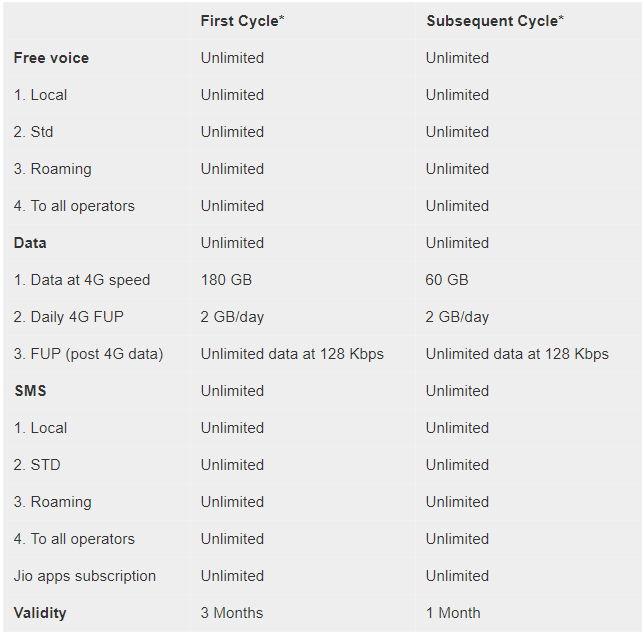 Apart from this, users will get unlimited voice and STD calling to all operators and access to all Jio applications. Moving on to the prepaid customers, the Rs 399 recharge comes with a validity of 84 days and users will be getting 84GB of data with a daily FUP limit of 1GB per day. Meanwhile, the Rs 309 and Rs 509 recharges offers 56 days of validity and users will get 56GB (1GB/day) and 112GB (2GB/day) respectively. The Rs 999 comes with a validity of 90 days and offers 90GB of data, while the Rs 1999 comes with a validity of 120 days and offers 155GB of 4G data. The Rs 4999 and Rs 9999 recharge offers validity of 210 days and 390 days. The former recharge options give 380GB of 4G data, while the latter gives 780GB of 4G data. Lastly, the Rs 19, Rs 49, Rs 96 and Rs 149 comes with a validity of 1, 3, 7 and 28 days and offers 200MB, 600MB, 7GB (1GB/day), and 2GB of 4G data respectively. Like postpaid users, prepaid users will also get free unlimited voice calls local and STD to all operators and access to Jio apps. Current time: 04-22-2019, 11:51 PM Powered By MyBB, © 2002-2019 MyBB Group.